USA Today Readers are an affluent and loyal audience of individuals who are active consumers. Reach national and even international readers with your advertisement for products, services, gifts, real estate and more. USA TODAY provides dynamic news that is colorful and riveting. USA Today provides its audience with the news they can use. How, when, and where they want it! Breaking down complex issues with visual storytelling and a uniquely personal focus. View the section profiles listed below for information regarding our targeted Marketplace advertising features and classified advertising on USATODAY.com. USA TODAY offers print advertising in any combination of 24 print markets. USA TODAY reaches over 123MM* of the most influential American consumers each month. Whether in print, online, mobile or tablet, we impact their decision-making—and their decision-making impacts millions more. These consumers are productive and goal-oriented. They are optimistic, active, and exceptionally well informed, making them the people others turn to for opinions and advice. They actively and confidently talk about brands with their social network and, most importantly for advertisers, affect the bottom line. View the section profiles listed below for information regarding our targeted Marketplace advertising features and classified advertising on USATODAY.com. 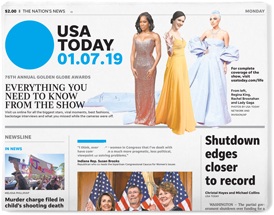 USA TODAY offers to advertise in any combination of 24 print markets. Contact us About USA TODAY Advertising Now!